Fiammastore awnings are the first choice for your motorhome, caravan and camper van. Manufactured in the Fiamma factory in Italy using the latest technology these are high quality case awnings for RV's! With a Fiamma awning you can double the living space or your vehicle quickly and enjoy a cool and covered open space. Ideal to keep you covered should a little light rain fall and allows wet gear to be taken off before entering the vehicle leaving you with less to clean up. Fiamma awnings combine state of the art technology with Italian design for an elegant, durable and affordable awning. Available in a range of sizes to suit your vehicle and with either a white or titanium case and deluxe grey or ocean blue vinyl to suit your taste. For an at-a-glance view of the features and details of the Fiamma Awning range download the printable PDF chart. Fiamma manufactures the only awning with a silent opening thanks to the the German TÜV certified Auto-Lock ® self-locking winch safety system: with its exclusive long life aluminium mechanical parts it offers you a quality product vastly superior to other comparable noisy hook release mechanisms on the market. front bar by two small plastic flags inside the side end caps. Has it ever happened that you roll up the awning, get to the end then cannot close it? Perhaps even damaging it? Never with a Fiamma Awning! The One Way Roll is an ingenious patented mechanism that prevents the fabric from wrapping on the roller tube. You cant go wrong. Only Fiamma has the Dual Shock-Absorber which protects both your vehicle and your awning. The arms are fixed with the certified double bolts system 'Double Block' which grants more stability and ease of regulation. Highly resistant reinforced articulated arms with a strong 3.5mm cable wire. They are proof tested to more than 10000 cycles of opening and closing and can maintain a steady fabric tension of up to 32kg. The telescopic system of the legs with manual locking allows the regulation of the lead bar height. This system allows you to regulate the height of the awning according to your needs. 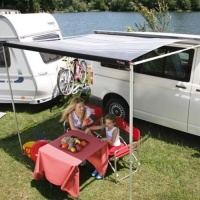 The Fiamma Awnings have a dual fixing possibility for its incorporated legs: to the wall and to the ground. The Fiamma Awnings have exclusive Italian designed anti-scratch canopies printed on the whole length. They are without seams and have a high resistance to UV rays. It does not fade in the sun and the absence of seams allows high resistance to water and tearing. It is flame-retardent, can be rewound when damp, is light-resistant rotproof and waterproof. All the canopies are printed on both sides. The sealedouter layer is highly protected to allow complete and easy cleaning and care.